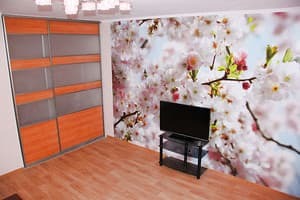 Cozy one-bedroom apartment is a 5-minute walk to the central square of Sumy. The apartment is located next to the grocery store, cafe, bank. The apartment has new comfortable furniture, appliances (refrigerator, flat TV, boiler, microwave, iron, hair dryer). Free Wi-Fi is available. The apartment has fully equipped kitchen where you can prepare meals on your own taste. Distance from the apartment to the train station is 2 km, bus station - 5 km. Description of the room: The apartment is located on the sixth floor of the house. The apartment has new comfortable furniture: a double wide folding corner, a wardrobe, a coffee table. Плазма. Неожиданной было относительно чисто. Раскладной диван, очень кривоват, спать было не удобно. Можно было поставить и кровать. Ну а так на 4 с 5. Владелец квартиры встретил нас на жд вокзале и отвёз на квартиру. На ул. Новоместенская была занята квартира,и как раннее договорились по телефону нам предложили за такую же сумму квартиру на пер. Институтский. Квартирой мы остались довольны! Заселился быстро. Так как это квартира, в моем распоряжении оказалась кухня, что было очень кстати. 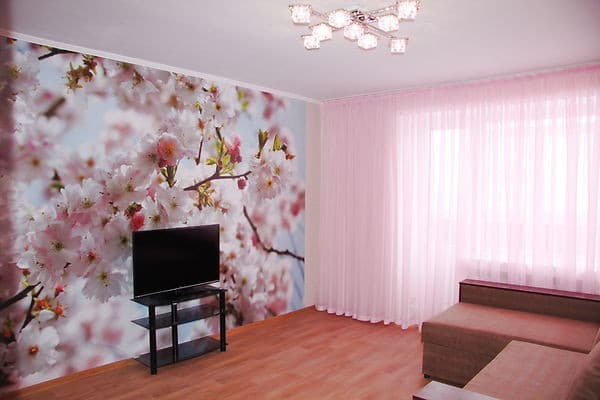 Cozy one-bedroom apartment is a 5-minute walk to the central square of Sumy. Distance from the apartment to the train station is 2 km, bus station - 5 km. You can reach the apartment from the central train station by shuttle bus №14. You can reach the apartment from the central bus station by shuttle bus №23.